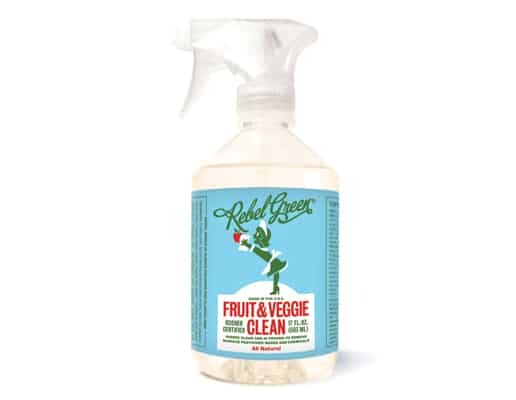 Rebel Green’s Fruit and Veggie Clean - Rebel Green: Eco-Friendly Products Responsibly Made in the U.S.A.
On a mission to help folks get their produce clean, Rebel Green’s Fruit and Veggie Clean is the product that launched their entire line of plant based cleaners. It’s a kitchen staple and if you think rinsing your fruit and veggies with water is good enough, think again. A good-enough clean is not clean-enough for the foods you feed yourself and your family. When you use Fruit & Veggie Clean you are helping to wave goodbye to pesticides, waxes and chemicals, none of which you want to ingest. There’s no substitute for clean. Rebel Green’s Fruit & Veggie Clean ($6.99) is natural, plant based and made with organic extracts of lemon and lime. It rinses clean, leaves no residual taste and is proven to help remove surface waxes and chemicals. You wash your hands before you eat and it’s just as important to wash your fruits and veggies. We can only imagine the journey your produce took before it found its way to your plate and did you know that, on average, 20 to 30 people touch your produce before it gets to you? Rebel Green’s Fruit and Veggie Clean is a simple and fresh bubble bath for your produce! It also comes in a pretty bottle that lends great counter appeal or should we call it “counter envy”. So good looking you’ll want to show it off! Now, that’s what we call green with envy!